Robots capable of diagnosing a disease, playing badminton, playing musical instruments or fighting like warriors are the stars of a congress in China about smart machines that can revolutionize the country's economy. The world of robotics exhibited is fascinating: an articulated arm capable of writing characters, androids from the local group of Gee electric appliances playing the drum, a fish robot that turns into an aquarium or a bat-raising machine that raises flight. Automatons with screens of Cantonese company Inbot, able to perform the functions of teacher or salesman, perform a synchronized choreography, while other miniature robots compete for a football match. But the real attraction remains the robot fighting they face in a ring, amid the exclamations of fascinated spectators, miniature tanks, swift and armed with sharp blades that collide with each other and mutilate with a loud bang. "The personality of my robot reflects mine! And I love the sparks ...," says Huang Hongsong, one of the young Chinese men whose machines are in competition. But beyond the ludic aspect, China hopes to win in the international arena the battle of industrial robotics, in the context of the exacerbated technological war with the United States. With an aging population and a growing shortage of local labor, the Asian giant relies on the automation of factories to maintain its industrial development. "Robots are the crown jewel for the manufacturing industry ... a new frontier," was enthralled this week at the Xin Guobin congress, the Chinese deputy minister of Industry. President Xi Jinping himself had called in 2014 a "robot revolution". China is already the first market for industrial robots, with 141,000 units sold last year (+ 58.1%) and a third of world demand, according to the international robotics federation. This demand can grow 20% by 2020. "The potential for automation continues to be immense: by 2016, China had 68 robots for every 10,000 employees, four times less than in Japan or Germany," explains Karel Eloot, a McKinsey cabinet specialist in Asia. Only 27 percent of the industrial robots sold last year were Chinese companies: Beijing wants this market share to rise to 50 percent by 2020, and then to 70 percent by 2025, according to the "Made in China 2025" technology plan. According to Eloot, this is a tricky proposition: "It would be necessary to double the number of Chinese engineers in robotics ... and to mitigate intellectual property gaps. Chinese companies own less than 1% of patents." In addition, the social cost can be high: according to the World Bank, up to 77% of Chinese jobs are likely to be automated. 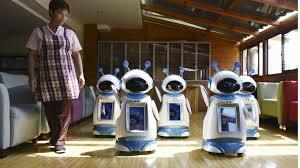 However, outside the factories, robotics is already flourishing in China in restaurants, banks, and the medical sector. The Chinese iFlytek presented in Beijing its "robot medical assistant", supposedly able to take a questionnaire to a patient and identify 150 diseases. "It has been used in hospitals since March and has helped to make about 4,000 diagnoses," said Liu Qingfeng, president of iFlytek, which aims to "provide artificial intelligence to doctors in isolated regions." IFlytek is also testing a robot jurist, who was supposed to help the judges determine the verdict. In turn, Chindex, a subsidiary of the Fosun conglomerate, distributes articulated surgical arms of American design "Da Vinci" in China. In an operating room equipped with high definition cameras and multipositional scalpels, this robot "transcends the limits of the human eye," says Liu Yu, Chindex's chief operating officer. "It only helps the doctor, it can not replace it. It would not be ethical, the human body is too complex," he says. With 160 companies represented, this 4th World Congress of robots reveals the emergence of technologies that allow automata to replace humans.